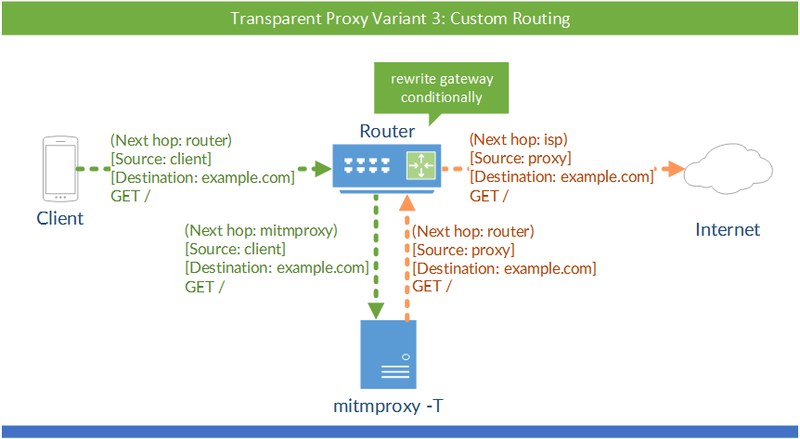 By default mitmproxy will use its own local IP address for its server-side connections. What I want instead is mitmproxy to use the client’s IP address for server-side connections. However my setup consists of a custom debian router with 2 NICs. While this works as intended, I'd like to be able to spoof the client source address so that the HTTP(S) requests captured match the TCP packets and other traffic also coming from the client. You cannot use Client's ip...proxy is intermediary device/software to whom client ask for data. Client asks for proxy to contact server, proxy contacts server. If you want to bypass client configuration for proxy you have to apply arpspoof command (arpspoof -i -t -r , using these you don't have to route your traffic to proxy via router. Not the answer you're looking for? Browse other questions tagged linux man-in-the-middle proxy router iptables or ask your own question. How to protect from ROM-0 via port triggering? Linux responds to ARP requests for other interfaces - could this be a security vulnerability?